The Cowichan River is the finest trout stream on Vancouver Island and one of the best in the whole province of British Columbia. It is a very generous river; it provides water for commercial and domestic use, family recreation in the summer, and fishing during the seasons of fall, winter and spring.The Cowichan's water is usually too warm for fishing in the summer. Anglers should refrain from fishing in warm water to prevent stressing fish. The Cowichan has an eco-system unique for Vancouver Island and most coastal streams of British Columbia. Unlike many of these streams, the Cowichan has a fine population of insects, crustaceans and annelids. These in turn form a food base for a thriving population of resident trout. The Cowichan River supports two species of native trout: the rainbow and the cutthroat , and an introduced species: the brown trout . Stocked originally in the 1930's, the brown trout is surviving and reproducing quite well on its own. Most of the Cowichan's trout are now wild. Besides trout, the Cowichan also supports steelhead and three species of Pacific salmon: coho , chinook and chum. Late March and early April is the real beginning of trout season. Golden stoneflies begin to hatch in March and a few trout begin to feed on them. Brown trout are especially aware of this food source. Unfortunately, most of the larger rainbows are still on their spawning redds and aren't interested in feeding. By mid April there is no place I would rather be than the Cowichan River. Wildflowers are in bloom and mayflies are hatching. The Western March Brown (Rhithrogena Morrisoni) is the most important mayfly hatch on the Cowichan. It is the only mayfly hatch that consistently brings trout to the surface. This big mayfly is most numerous in the fly fishing section of the upper Cowichan. The W.M.B. begins to hatch in March, but the river is usually too high at that time to have dryfly action. Trout will be dining on the nymphs instead, and take them in preference to duns when the water is high. Trout are unwilling to rise through the Cowichan's fast currents in high water. Trout become selective when the mayflies hatch about mid-day. The WMB dun has a tan body, brown thorax and speckled grey-tan wing. The spinner has more of an orange-brown color with a darker body and clearer wings. A properly presented size 12 Adams is an adequate imitation for the dun. The spinner requires a more specific pattern like a red quill. Prior to the mid-day rise, trout will take a free drifting mayfly nymph. Dryfly action is best from about 12:30 to 2:30, and later in the evening when caddis hatch. The Cowichan caddis hatch usually occurs starting in late April and continues throughout May. At times there is a blizzard hatch and the trout go on a feeding frenzy. The caddis is about size 14 but trout will accept anything up to size 10. A deer hair pattern is as good as anything and floats better in the fast water. The caddis pupa has a medium olive body and dark grey thorax. The adult has a grey-brown body and a ginger-tan wing. Fly pattern usually isn't as important as presentation. Trout prefer a free drift with the odd twitch. The induced rise is a good technique when fishing the pupa. When the caddis or mayflies aren't hatching trout revert to feeding near the bottom. Sometimes they selectively feed on the stone cased caddis larva. By June the only rise is in the evening. In the autumn, rainbows rely heavily on salmon eggs to fatten them up for the winter. Large rainbows migrate downstream from the lake to join the few resident fish dining on the eggs. From Late October to January, trout may take other items, but salmon eggs are their principal source of nourishment. The larger Cowichan rainbows, cutthroat trout and brown trout gorge themselves on salmon fry in the spring. Along with the occasional crayfish, salmon fry and steelhead smolts are the main diet for large brown trout. 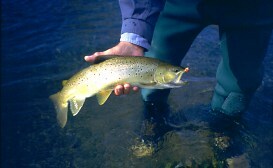 Browns are the largest trout in the Cowichan and are taken up to 10 pounds each year. 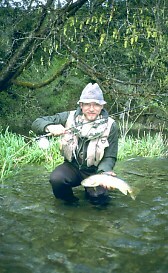 The larger trout are strictly evening feeders. Brown trout migrate to the Cowichan's few spring fed pools to escape the warm summer temperatures. 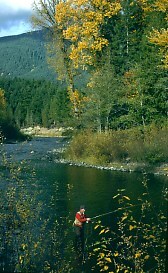 The Cowichan River has some of the finest trout fishing anywhere from late October to December. These months provide the most trout and the largest. Prior to spawning, the Cowichan's rainbows are eager feeders and strong fighters. Brown trout spawn in the fall and school up in specific locations. While fishing the upper Cowichan in January, sometimes an early steelhead grabs our fly. It doesn't take long to find out. They are like silver rockets with the after burners turned on. 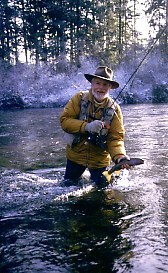 Winter steelhead enter the Cowichan about mid December. By Christmas there is usually a good run in the river. Most of the action is from Duncan through the middle portion of the river. Some steelhead reach Skutz Falls in late December, but very few reach the upper river until mid-January. The Cowichan River has some access problems for anglers. Much of the property is private, but there are several access points along the river. Sandy Pool, Stoltz Pool and Skutz Falls are popular areas to begin. Above Skutz Falls is an old railway grade leading to the 70.2 mile railway bridge and trails along the river. The bridge is no longer in use and it marks the lower boundary of the fly fishing section. From the bridge upstream to the village of Lake Cowichan is the best trout fishing on the river. Fishing access is off the old Lake Cowichan highway, Hudgrove road and Greendale road. A favorite spot off Greendale is the road pool. It's popular for fly fishermen and boaters planning to drift the river to Skutz Falls. The land is private, but the owner allows egress to responsible citizens. Greendale road enters the village of Lake Cowichan at the old railway bridge. Two pools down from there is Stanley Creek, the upstream fly fishing boundary. Across the river, on the south side, is Sahtlam road that connects to Hudgrove road at the village's sewerage ponds. Downstream from there is access through private property. Please ask before using. This area is fly fishing only. Bait is banned on the upper Cowichan between Stanley Creek in Lake Cowichan Village and Skutz Falls, 10 km downstream. This protects spawning steelhead and trout without preventing fishing. The Cowichan is the most regulated river in British Columbia and consequently it's one of the best. Besides the Cowichan's somewhat confusing regulations is the question of angler's ethics. Because private property limits some access and in high water the riverside willows restrict the remainder, it is common for anglers to drift the river in boats. In the winter there is a steady stream of dorys, rafts and aluminum skiffs drifting by. Many of these drifting anglers are polite and bypass people fishing from shore, but a few anglers anchor in front of other fishermen and ruin their sport. 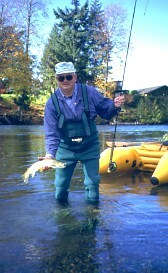 The Cowichan River is far from pristine; it is often crowded, but the fish are there and it is generous to all. With a little patience and some traditional skill the rewards are great.